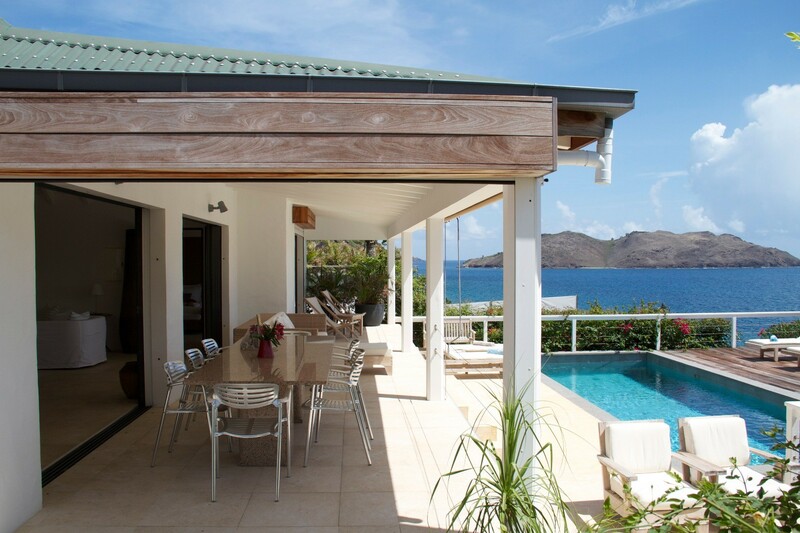 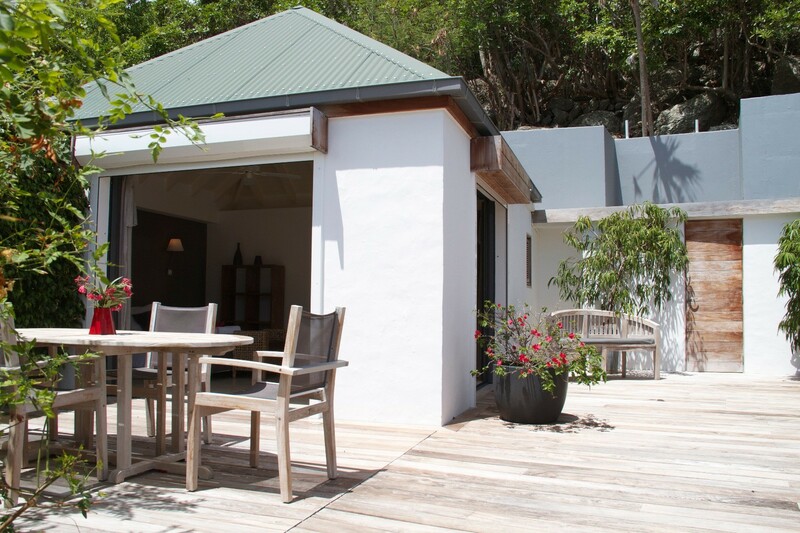 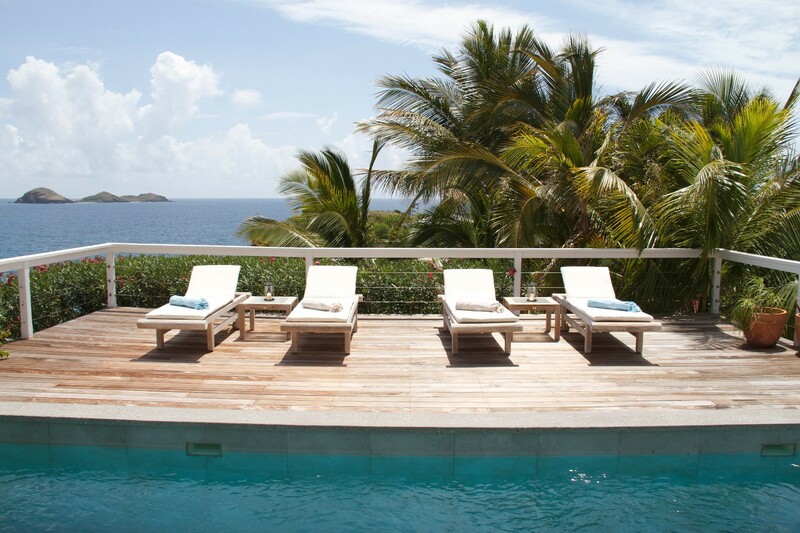 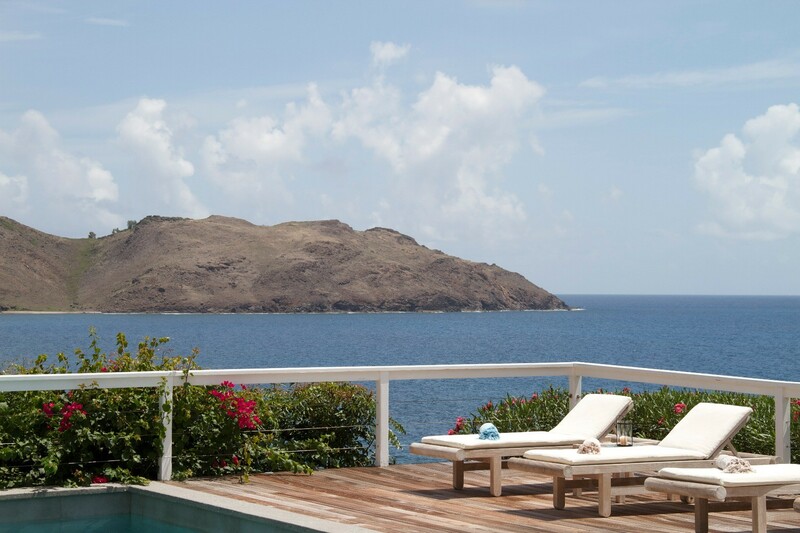 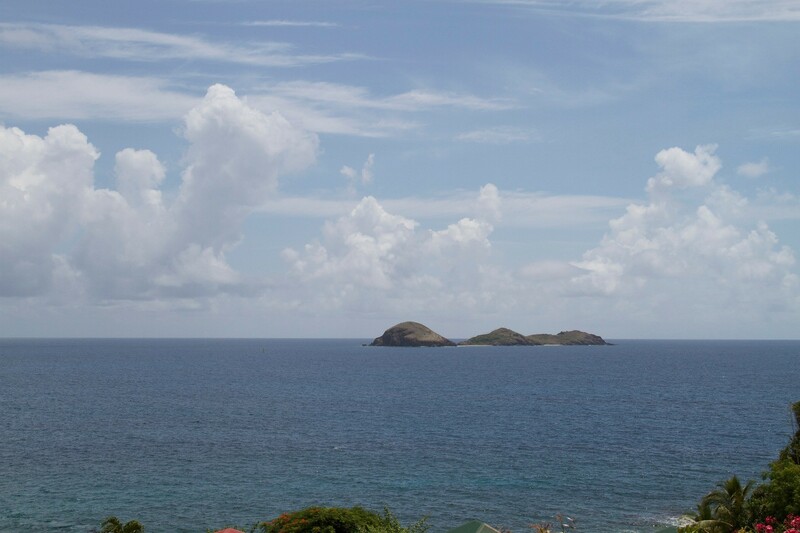 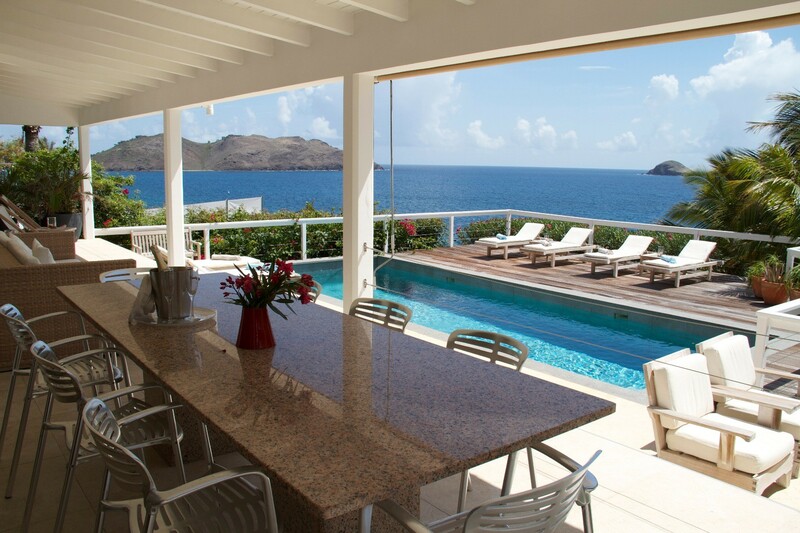 Set above the sea in the Anse des Lezards area of St. Barts, and only a short distance from the popular Flamands Beach, the Villa Jali (ABT) offers uninterrupted sea views, a good balance of indoor and outdoor living spaces, and interiors that are both soothing and sophisticated. 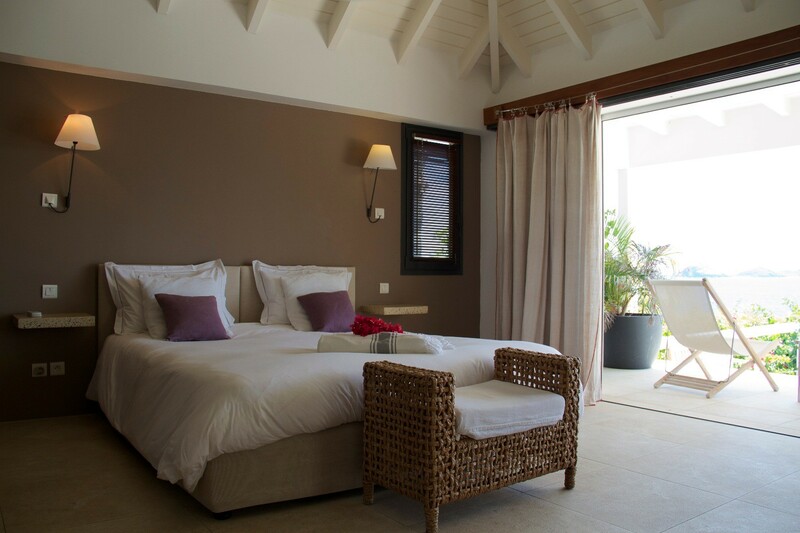 The three-bedroom villa is split between two floors. 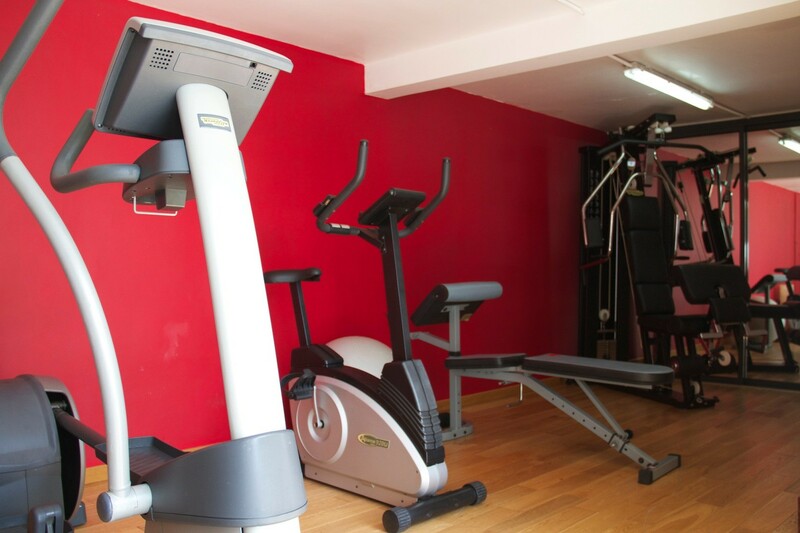 On the lower level, guests can enjoy the use of a full fitness room and an office space. 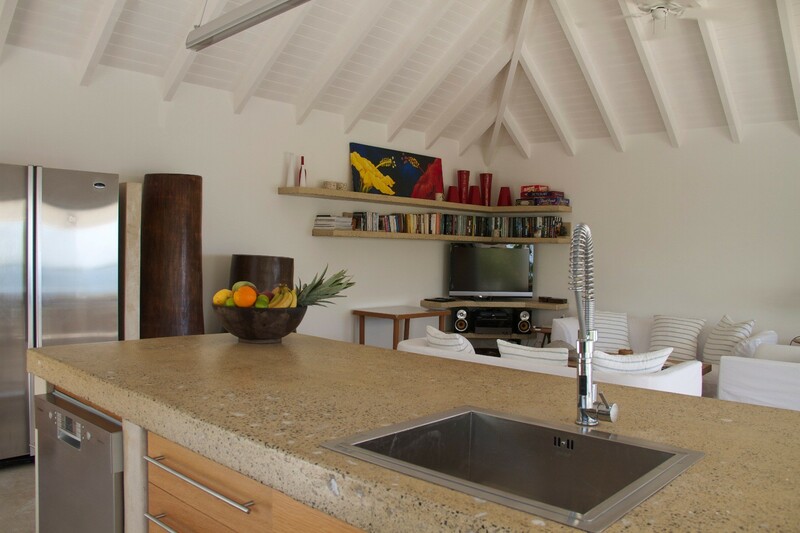 Above, the shared living spaces and a single bedroom suite are found. 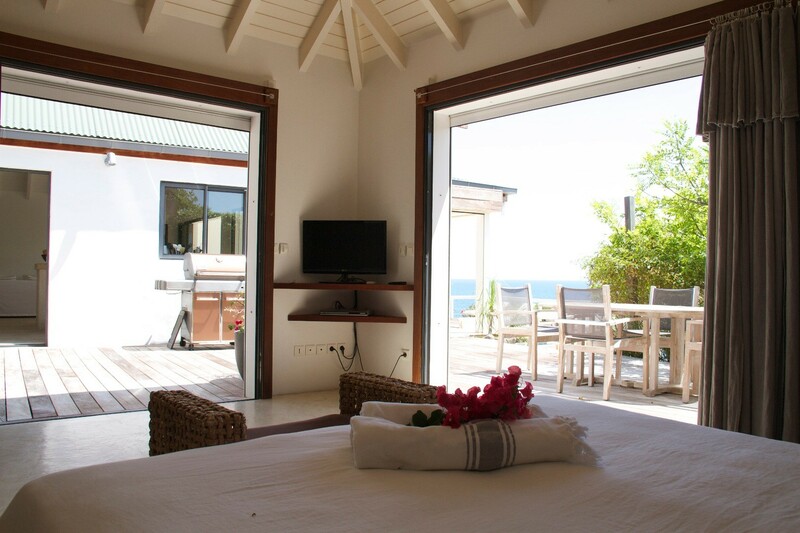 Two small bungalows contain the remaining bedrooms, ensuring plenty of privacy along with enjoyment of the impressive views. 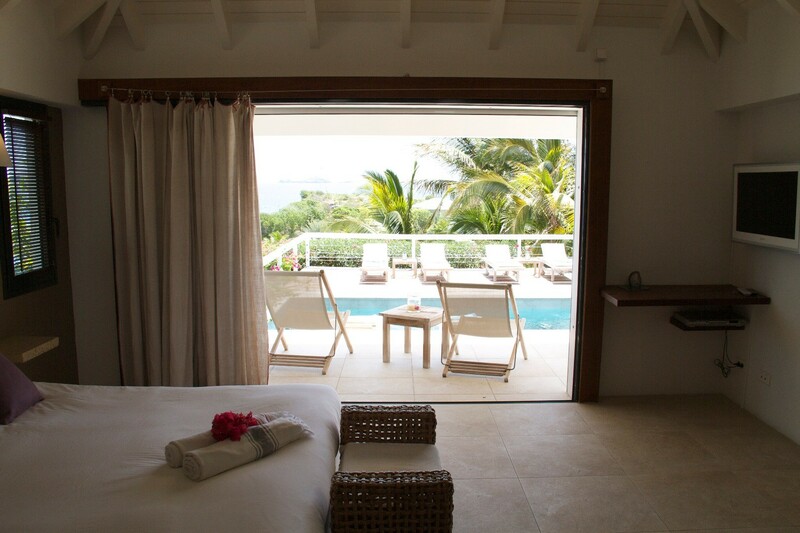 The main level living spaces include the lovely pool terrace with its wooden sun deck, long stretch of pool, and marble terrace that leads to a covered portico area. 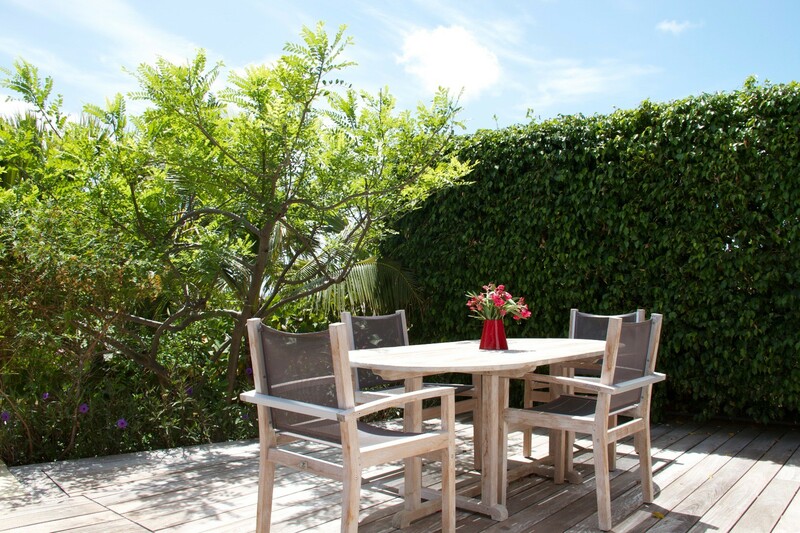 Here, guests can enjoy al fresco dining, a large outdoor lounge, and sun chairs for hours of enjoying the scenery. 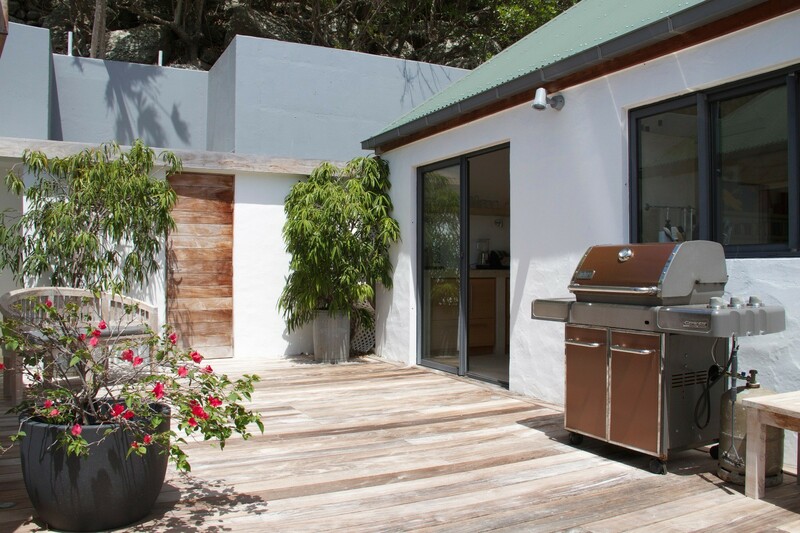 There is also a barbecue area just outside the large, modern kitchen. 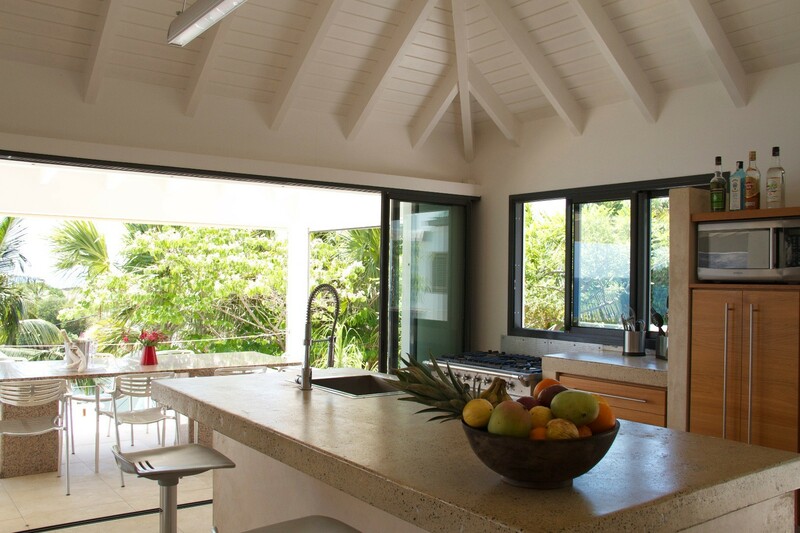 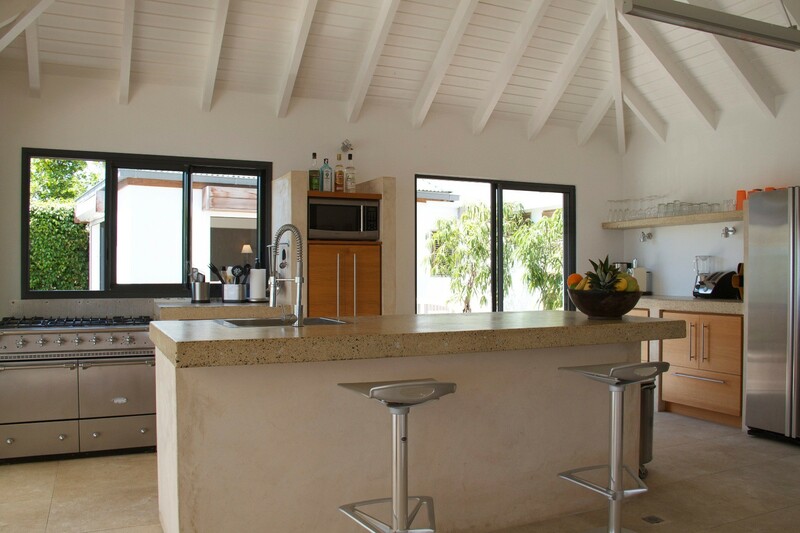 Inside the main part of the villa, a large and airy great room provides guests with a professional-quality kitchen that features marble work spaces and a breakfast bar. 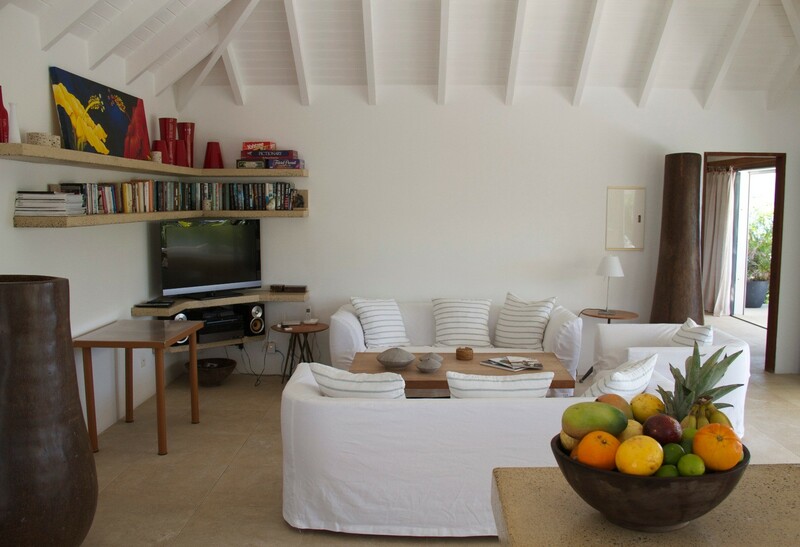 This open into the living room area. 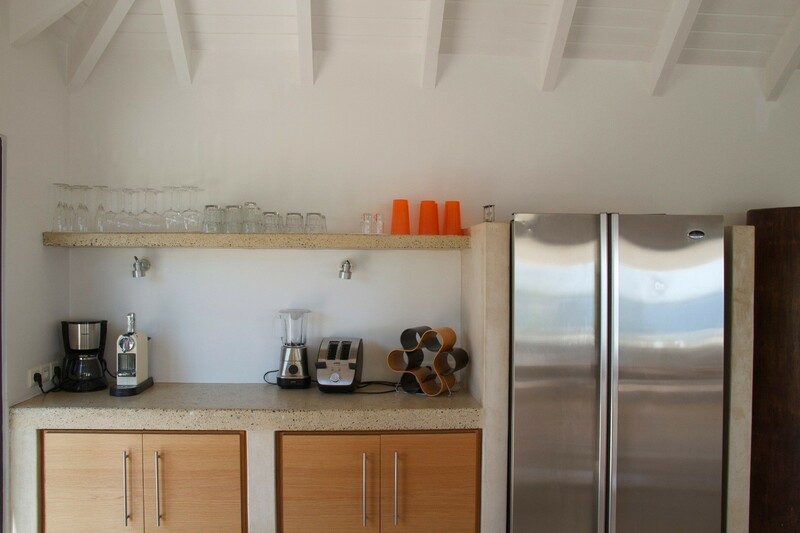 Furnished with generously sized pieces, it also provides an entertainment center and casual dining spot. 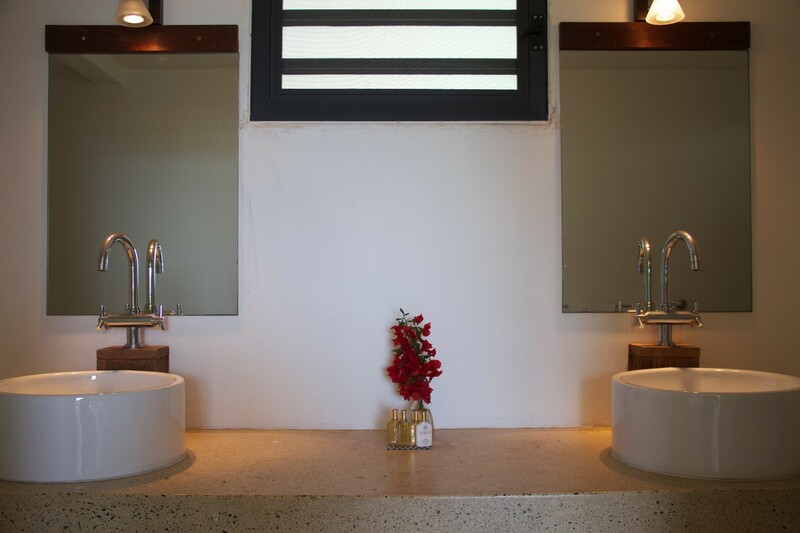 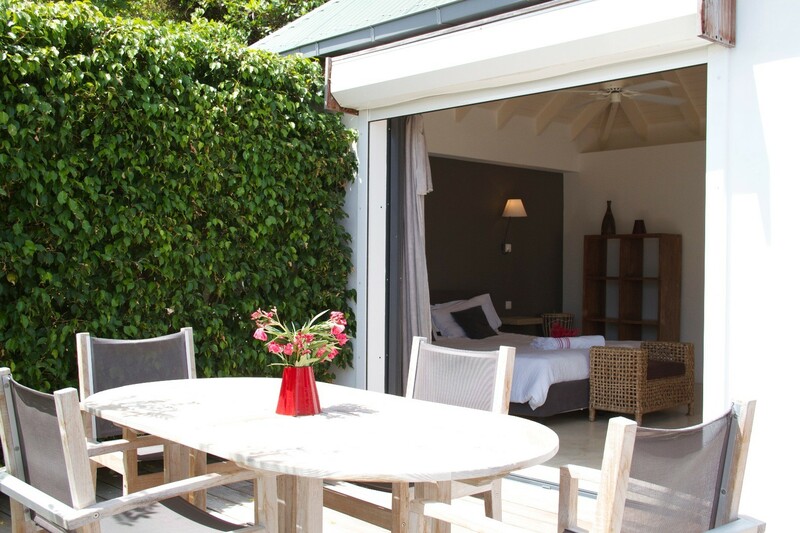 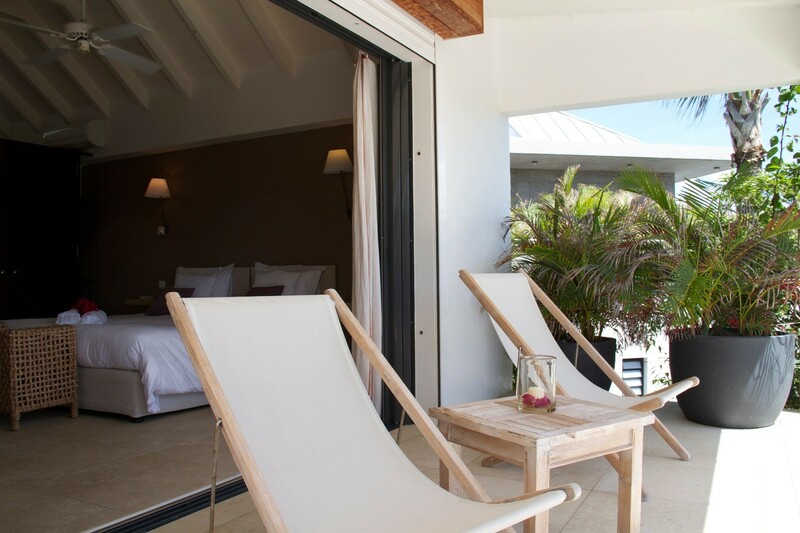 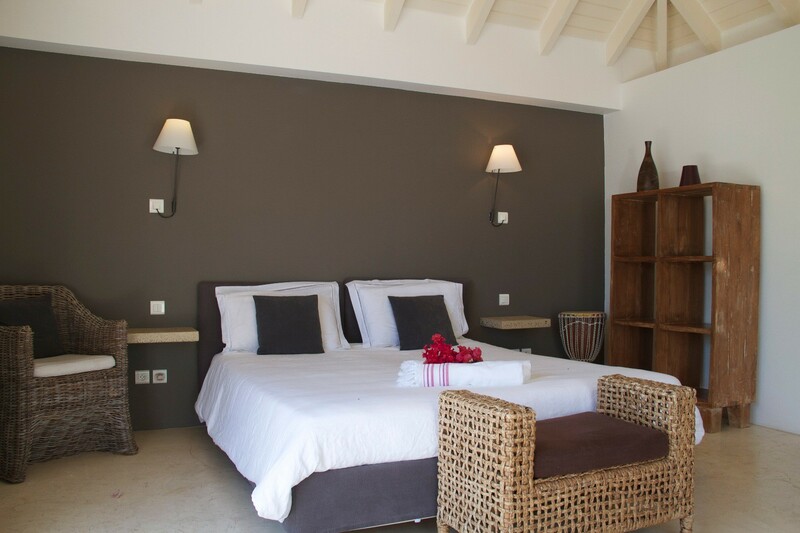 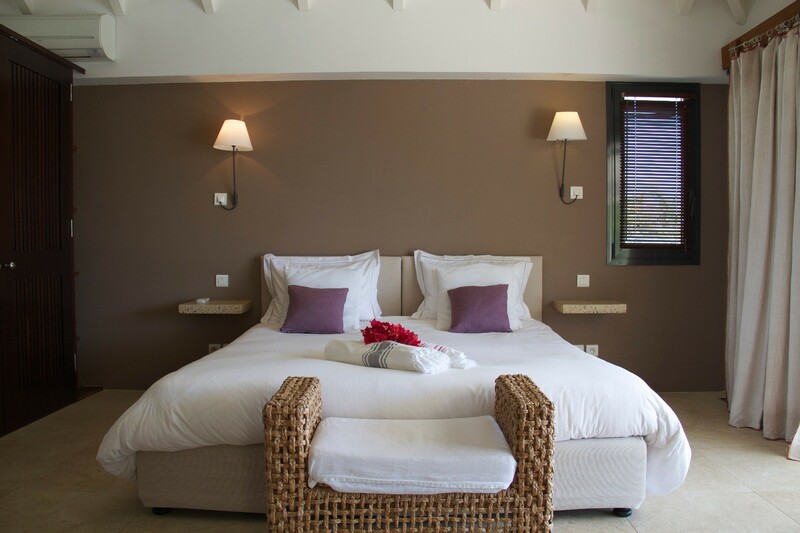 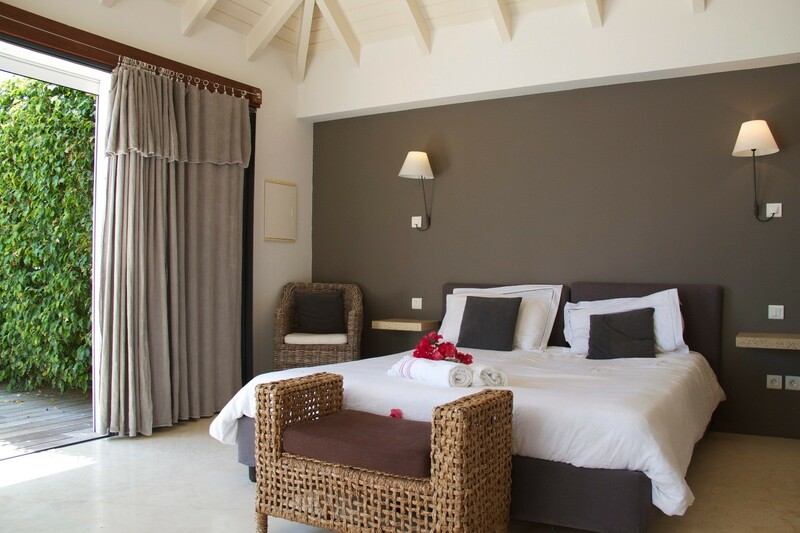 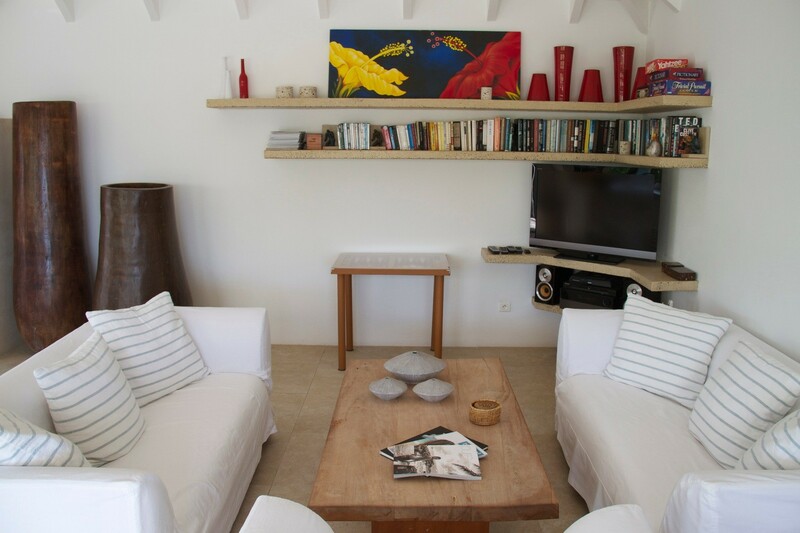 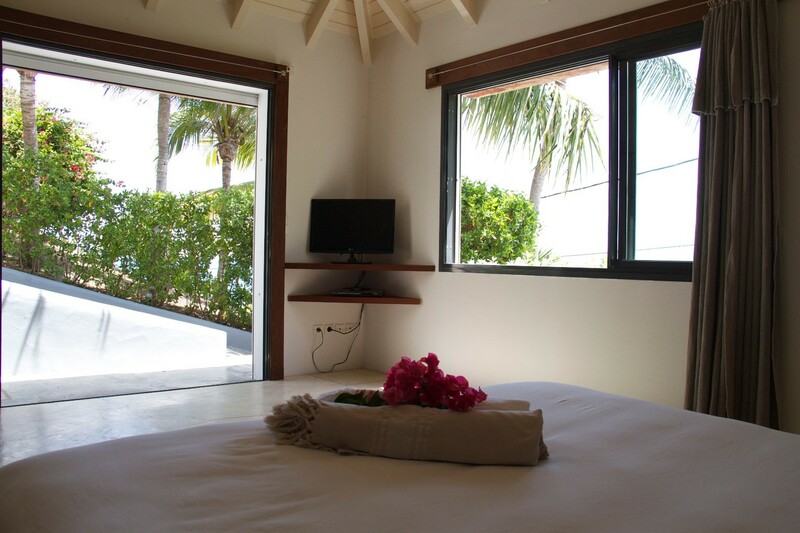 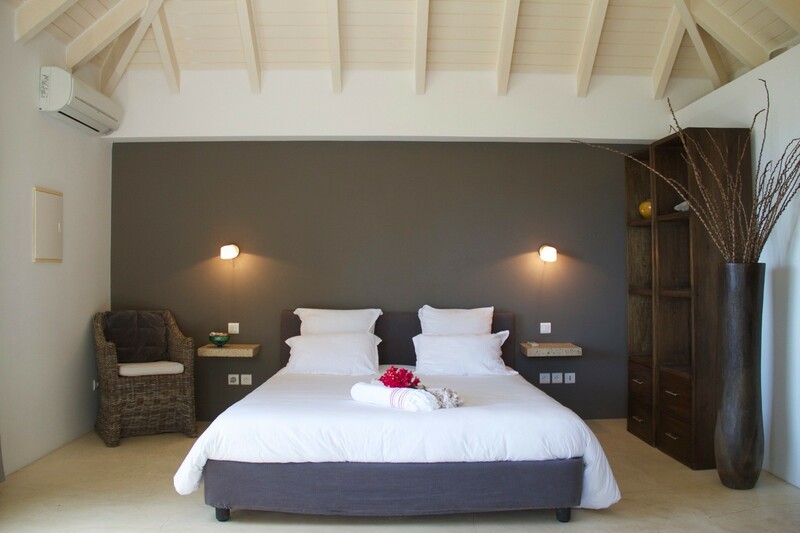 The three bedroom suites are private retreats. 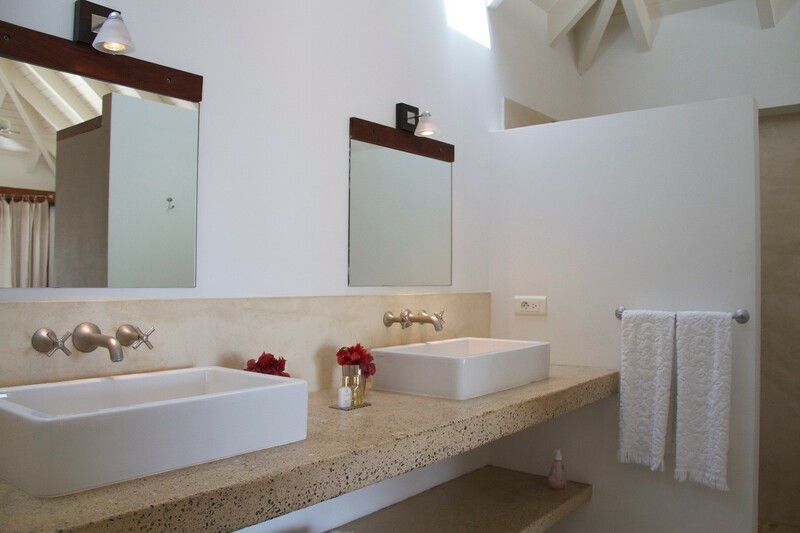 One is a king suite that offers a high end entertainment system, a large and private bath, and a sitting area that opens to the terrace. 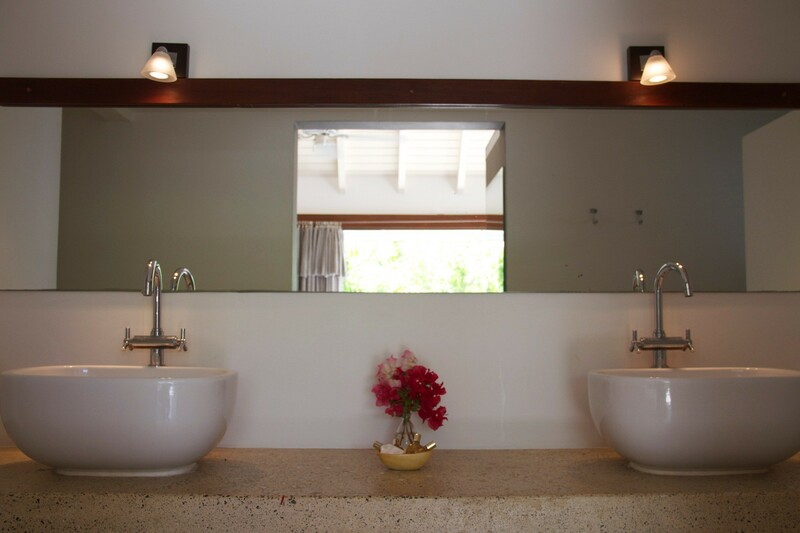 Another suite is also king and is housed in a separate pavilion with a large, private bath. 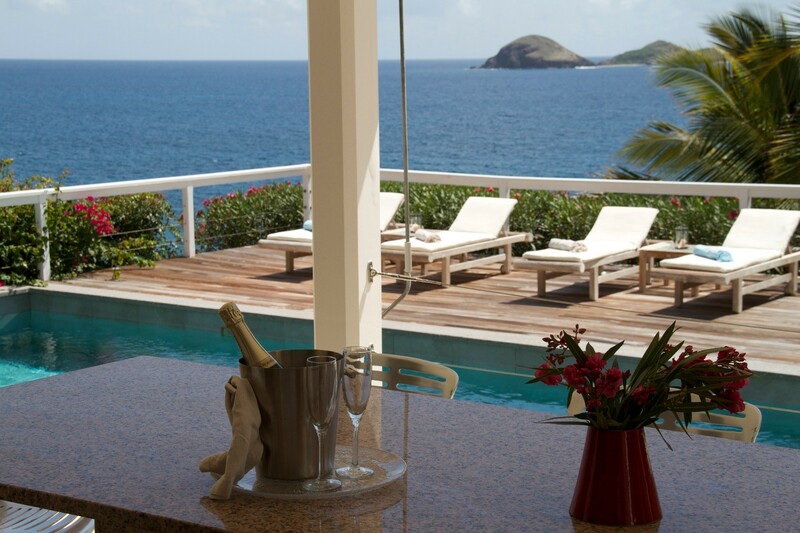 The final suite features two twins, an entertainment system, and a private terrace. 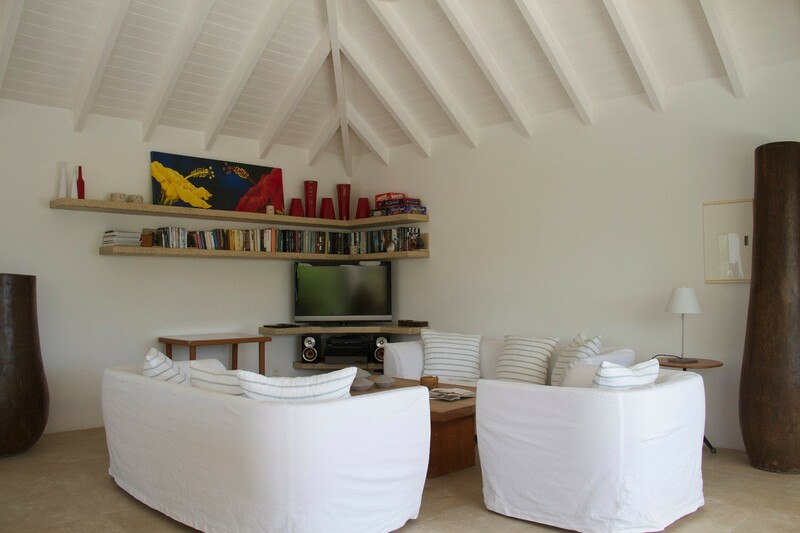 Whether you are part of a group of discerning travelers looking for a private, tropical paradise close to some of the best dining and sightseeing or a family seeking a private getaway, the Villa Jali (ABT) is likely to answer your need.